Democratic Virginia gubernatorial candidate Ralph Northam has erased references to his environmentalist running mate Justin Fairfax in a campaign flier in order to appease labor union members in northern Virginia. In Virginia, governors and lieutenant governors are elected at the same time, but separately. In 2005, for example, the Republican gubernatorial candidate Jerry Kilgore lost while his running mate Bill Bolling won. 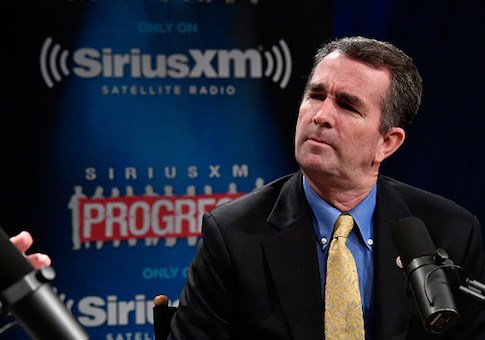 In early Northam fliers, the candidate promoted both lieutenant gubernatorial candidate Fairfax and Democratic attorney general candidate Mark R. Herring. But in an alternate version recently shared by Virginia Republicans on social media, the campaign only promoted Northam and Herring. The new version comes just weeks before the election in November. The campaign says the altered version was only for campaign material provided to the Laborers' International Union of North America, the Richmond Times-Dispatch reported. The union confirmed it requested Fairfax's removal, saying he "wasn't supporting us on the issues." A liberal environmentalist, Fairfax opposes the construction of two natural gas pipelines through Virginia, the Mountain Valley Pipeline and the Atlantic Coast Pipeline. Labor unions, Northam, and Herring support the pipelines. "Out of over 3 million pieces of literature printed for the campaign, this literature constituted less than roughly 0.5 percent of the literature printed, and was only for LIUNA to carry on their canvasses," a Northam spokesman told the Times-Dispatch.